A fundamental aspect of the work of ecosystem restoration is to rediscover the past and bring it into the present -- to determine what needs to be restored, why it was lost, and how best to make it live again. Yet until now, there has been no guide to the various techniques available for determining that information and how those techniques can be used. 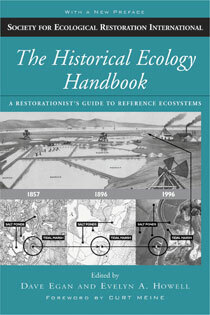 For the first time, The Historical Ecology Handbook makes essential connections between past and future ecosystems, bringing together leading experts to offer a much-needed introduction to the field of historical ecology and its practical application by on-the-ground restorationists. The book begins with an overview chapter that introduces important concepts from ecology and restoration, and discusses various factors that need to be taken into account when attempting to discover and use historical information. Following that is a chapter-by-chapter presentation of individual techniques focusing on both culturally derived evidence (documents, maps, photographs, land surveys, oral history) and biological records (woodlot surveys, tree rings, pollen, packrat middens, opal phytoliths, animal remains, records of changes in soil and hydrology). Each chapter is written by a leading expert and offers essential background, tools, and resources needed for using the technique in a restoration effort. The book ends with four in-depth case studies that demonstrate how various combinations of techniques have been used in restoration projects. Case studies are from Nantucket, the Indiana Dunes, the Greater Grand Canyon Region, and the San Francisco Area Historical Project. Among the contributors are M. Kat Anderson, Kenneth L. Cole, Owen K. Davis, Peter W. Dunwiddie, Robin Grossinger, Michael L. Morrison, Michael J. O'Brien, Thomas W. Swetnam, Stanley W. Trimble, Gordon G. Whitney, and many others.